RAF Rule (Royal Air Force Rule) provides a binocular gauge to measure Objective and Subjective Convergence as well as Accommodation in 1 mm increments. The RAF Rule consists of a 50 cm long rule with a slider holding a rotating four-sided cube. Each side has a different target. The first has a vertical line with a central dot for convergence fixation. The others provide a limited number of lines of near reading examples. A rest is provided for the cheek to insure consistency and proper height for the patient. Some studies have shown greater consistence of the NPC when measured with the RAF Rule compared to using a pencil or finger. 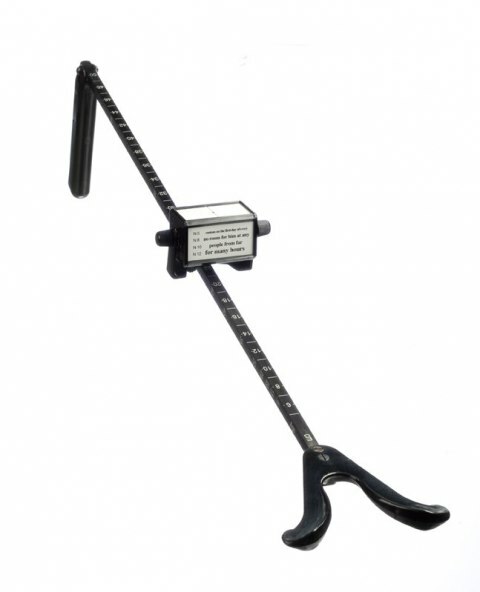 This instrument is used for determining the objective and subjective convergence points, examining the accommodation and determining the master eye. The RAF Rule is useful for both diagnosis and treatment.